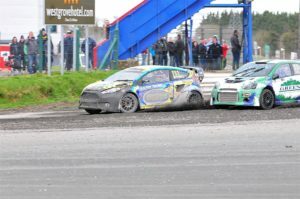 Double champion Derek Tohill got his bid for a hat trick off to a good start by dominating yesterday’s opening round of the Parts for Cars National Rallycross Championship at Mondello Park, once again beating regular rival Noel Greene into second place. Tohill led his fellow Dubliner in the heats to start the Supercar Final from pole position, and he led Greene all the way to guarantee another pole spot for the main race of the day, the Super Final. However, he got a bad start and Greene led the opening lap, only for Tohill to dive up the inside at the first corner of lap two, staying ahead to the finish. Rallycross Championship 2018 Derek Tohill who won overall, leading Noel Green into turn 1. Photo by Mark Ashby. Three former title holders battled for the leading positions in round two of the Triton Showers National Rally Championship, the Circuit of Kerry, with Donegal’s Donagh Kelly and Declan Boyle coming out on top, ahead of Roy White from Tipperary. Monaghan’s Moffett brothers, Josh and Sam, took first and second places in the UAC Easter Stages Rally, finishing just four seconds apart after two days rallying through the Co Antrim stages. They took the top two points scoring positions in the opening round of the Irish Tarmac Championship in West Cork last month in the same order, and are now firmly established at the top of the leaderboard.